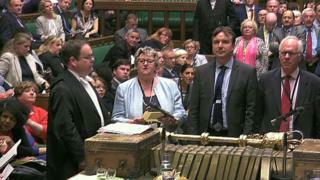 The minority Conservative government has survived its first major test after its Queen's Speech cleared the Commons. MPs backed the legislative programme - stripped back after the Tories lost their majority - by 323 to 309. But the government had to make a late pledge on funding abortions in England for women from Northern Ireland, amid fears of a Conservative rebellion. The Democratic Unionist Party's 10 MPs had agreed to support the government as part of a deal with the Tories. Three Labour frontbenchers - shadow ministers Ruth Cadbury, Catherine West and Andy Slaughter - were sacked by the leadership while shadow transport minister Daniel Zeichner had resigned. The sackings relate to the MPs' support for Labour MP Chuka Umunna's amendment during the Queen's Speech debate, which was defeated. The amendment aimed to preserve the UK's EU single market membership. This is not Labour policy, and the party's MPs were told to abstain but 50 rebelled. The government averted a possible rebellion by announcing women from Northern Ireland would get free access to abortions on the NHS in England. Abortions are only allowed in Northern Ireland if a woman's life is at risk or there is a permanent or serious risk to her physical or mental health - while they can travel to England to have one privately, they have had to pay for the procedure. Labour MP Stella Creasy had tabled an amendment which had attracted cross-party backing - but she agreed to withdraw it when the government announced its concession. Labour's amendment, which was defeated by 323 to 297, called for Brexit to deliver the "exact same benefits" as the EU single market and customs union, as well as scrapping tuition fees, increasing public spending and ending the public sector pay cap. Proposing it earlier, shadow chancellor John McDonnell described the Queen's Speech as a "threadbare scrap of a document" with many of the Tories' key pledges removed since the general election. He also claimed the cabinet was divided over Brexit, with "weekly changes of direction". Chancellor Philip Hammond challenged him to a "grown-up" debate about public spending, accusing Labour of asking voters "would they like someone else to pay higher taxes?" During the debate, one Tory MP, Heidi Allen, criticised the arrangement between her party and the DUP, saying she could "barely put into words" her "anger" at the £1bn deal. Ms Allen, who also criticised the Tories' general election campaign, said she wanted to put on record her "distaste for the use of public funds to garner political control" and warned that "never again" should a government prioritise spending in such a way.